What is a wedding candle? 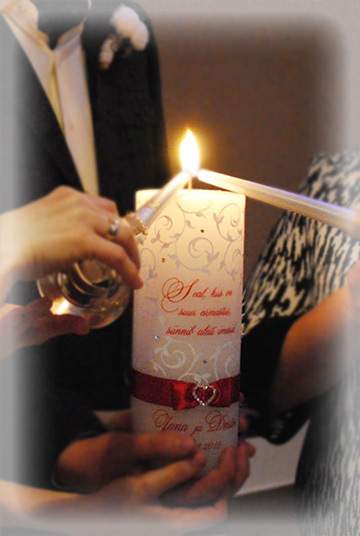 Wedding candle symbolizes the union of two lives in a marriage. In a wedding the candle is lit by the Master of Ceremonies (MC) or the Best Man, if the former is not present. According to another tradition the bride’s and groom’s mother both light a separate smaller candle to represent their offspring, then the bride and groom light the bigger candle symbolizing unity. The flame of the unity candle symbolizes their new life together as a husband and wife. When the wedding candle is lit, it can be taken from hand to hand among guests so that each guest or guest couple can wish something good to the wedding couple. In another tradition a small speech can be given by the MC, Best Man or parents of the wedding couple. From there on the wedding candle is lit on each anniversary to bring back this wonderful day. On the wedding day a new family is born, a new home is born. In the tradition / ritual the importance is in the FIRE, which symbolizes warmth of home, love and security. Fire is also like a beacon which reminds where home is, where to set the course and where always is warmth, love and the family – this message is more for men who tend to have a more adventurous and restless spirit. Believe me when I say that all men want that somewhere a home, loving wife and family awaits them.